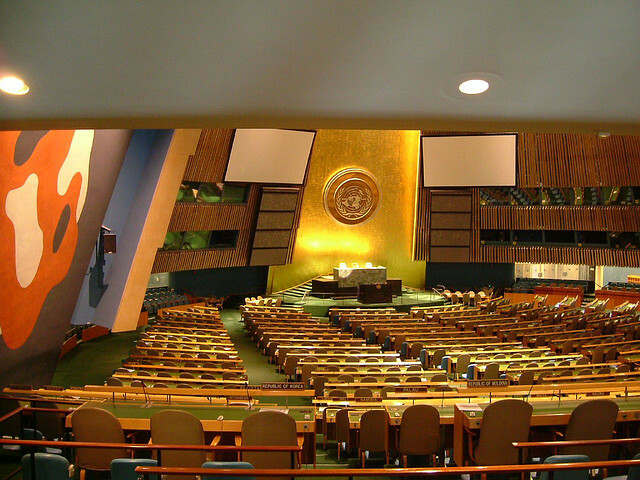 Syria, Iraq, Sudan, Gaza, Ukraine… What’s the point of the United Nations? Monocle magazine’s radio show The Foreign Desk put this question to UN experts in a fascinating podcast this week, asking the question which idly looms behind every humanitarian crisis, of which we have seen so many this year. Monocle’s foreign editor Steve Bloomfield interviewed Sir Nigel Rodley of the UN Human Rights Committee and independent diplomat Reza Afshar on the role of the UN versus the public’s expectations, and its historical track record. As for taking action during crises, Afshar was quick to argue that it is „misguided“ to think of the UN as an action body, because it is rather a body that authorizes others to take action. „But it can be a forum and voice to the principles underlining the UN charter,“ he explained. The panel also discussed the fallout of the UN’s dealing – or rather not dealing – with the Iraq war, and how the dynamic between the United States and other UN security council members functions. As for the current crisis in Gaza, Afshar says the UN’s best chance of solving the crisis would be for member states other than the US to drive momentum in public. The half-hour program concluded with an analysis of the changing tone and impetus of UN Secretary General Ban Ki Moon’s speeches.